If you are not an addict but dream that you are one, in a group of other addicts, then you are not of place in this group and dream. 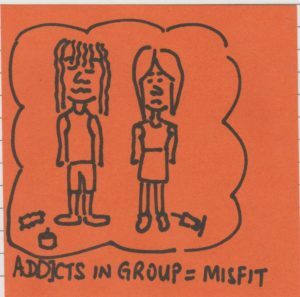 This could mean that in waking life, you feel you don’t belong in your correct group. That is why this theme of not belonging is carried into your dream. Since you have dreamed about being a misfit, then it is up to you to do something about this. You might try to look for your self-identity. Perhaps you can fit into another type of group. Like the idiom says, “Birds of a feather, flock together”. People can be grouped by interest. Your hobbies can be the common link that unites you with the group that shares the same interest.